Links have been observed between infections and the development of autoimmunity. Proposed explanations include activation of self-Ag-bearing APC. Using a model system in which transgenic OVA is expressed in enterocytes, we showed that CD8 T cell recognition of cross-presented Ag in gut-associated lymph nodes was tolerogenic. However, concomitant infection with vesicular stomatitis virus encoding OVA abrogated tolerance and induced disease. 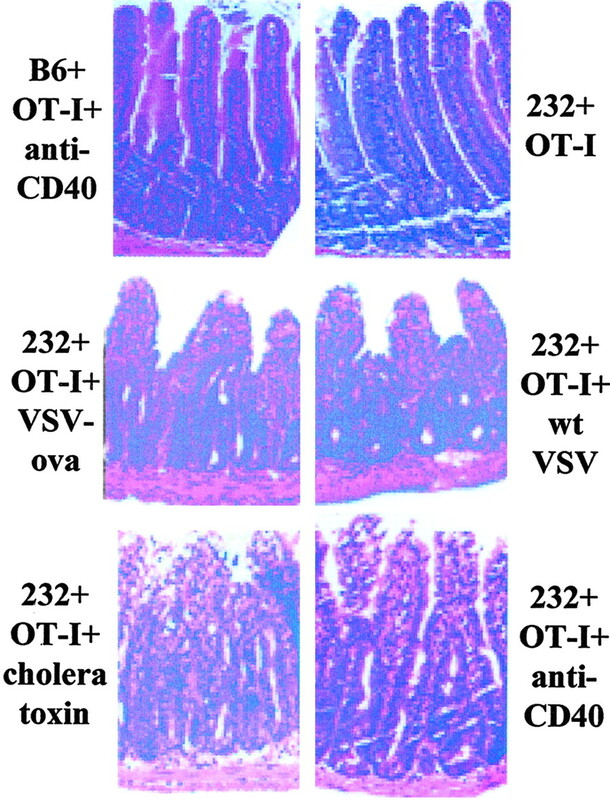 We now show that following transfer of naive OT-I T cells, the addition of wild-type vesicular stomatitis virus, oral cholera toxin, or CD40 triggering can induce intestinal disease in transgenic mice. Tissue damage accompanied dramatic increases in cytokine release by activated OT-I cells in the intestine. The data indicated that products of antigenically unrelated infections can combine with cross-presented self-Ags on APC to prime autoaggressiveness, independent of additional Ag release. These results help explain how diverse pathogens, lacking any homology to self-proteins, could be causative agents in induction of organ-specific autoimmunity. Autoimmune diseases affect various organs including the pancreas, CNS, and gastrointestinal tract. Whether all are the direct result of recognition of self-Ags remains unclear, although this does occur. In many experimental models, precipitation of autoimmunity is Ag-dependent, and dependent on the inclusion of compounds having adjuvant-like properties (virus, bacteria, CFA, or pertussis toxin) (1, 2, 3). Similar events may occur in human conditions where a link between infection and autoimmunity is observed. There are several possible explanations for such a link. Molecular mimicry, homology between microbial products and human Ags, occurs in myocarditis and Lyme arthritis (4, 5). Epitope spreading may be involved in autoimmunity (6). Release of self-Ag from tissue damage caused by organ-specific infections also may play a role (7). These explanations cannot account for the diversity of pathogens associated with specific autoimmunity, nor can they explain the association of one pathogen with many autoimmune pathologies. For example, Chlamydia, Salmonella, and Yersinia infections are linked to arthritis; CMV, EBV, and varicella infections are indicated in diabetogenesis; and CMV, EBV, and respiratory infections correlate to the onset of Guillain-Barre (8, 9). Therefore, general characteristics of infections, rather than specific Ag, could partake in disease induction. Bystander activation of autoreactive B or T cells is another possible explanation. However, evidence for naive T cell activation in an immunocompetent arena in the absence of Ag is rare and in one model system was shown to be inconsequential in diabetes development (10). Memory T cells can respond to bystander effects; nonetheless, the generation of true autoreactive memory T cells which did not cause disease initially is not well-documented (11). Thus, it was hypothesized that maturation of APC bearing self-Ag could occur during an inflammatory reaction to infections, resulting in autoreactive T cell activation and autoimmunity (12). At present, evidence for such a scenario is lacking. Recent work has broadened our understanding of the innate and adaptive immune systems. The concepts of cross-priming and cross-tolerance have emerged, along with discussions as to how these different outcomes are maintained (13). Possibilities include different APC lineages controlling each facet of the cross-presentation response or the environment may dictate the outcome of the antigenic encounter. For example, abnormal splenic architecture or hepatitis can be generated in mice producing a transgenic Ag via a MHC class I promoter after infection with various pathogens or CD40 activation (14, 15). These data show that inflammation drives tissue destruction in response to Ag produced by APC, as well as by parenchymal cells. However, the relevance of this to situations where Ag would be sequestered and cross-presented is unknown. Other models have assessed disease induction in relation to cross-presented tissue-specific Ags. Mice bearing OVA in islets develop diabetes after transfer of large numbers of cognate CD8 T cells due to cross-priming (16). This finding indicates that Ag alone can drive CD8 T cell-mediated tissue destruction. This result may depend on the organ studied because large numbers of the same T cell clone in the intestine do not cause disease (17). The ability of infectious agents to induce autoimmunity has also been examined in murine models (17, 18, 19, 20, 21). Because all of these systems use pathogens producing the target Ag, it was not possible to assess the role of the inflammation itself, irrespective of the presence of cross-presented Ag. Therefore, we analyzed the ability of nonspecific, nontissue damaging, inflammatory events to induce tissue-specific autoimmune reactions to an endogenous, cross-presented Ag, which under normal conditions induces tolerogenic responses. Our results provide an explanation for the induction of Ag- and organ-specific autoimmunity through the combination of normally cross-tolerizing Ag and the by-products of infection. The 232/C57BL/6J/CD45.2 transgenic line has been described previously (17). The mice used in this study are designated 232-4 in Ref. 17 . OT-I/RAG−/−/C57BL/6J/CD45.1 mice were bred in our facility. C57BL/6J/CD45.2 mice were purchased from The Jackson Laboratory (Bar Harbor, ME). All mice were used at >6 wk of age. Axillary, brachial, inguinal, and mesenteric lymph nodes (MLN)3 were isolated from OT-I mice and 5 × 105 to 1 × 106 OT-I/CD45.1 cells were injected i.v. into CD45.2 recipients. Where indicated, OT-I cells were labeled with CFSE (Molecular Probes, Eugene, OR) and 5 × 106 were i.v. injected. PFU (1 × 106) of virus (either vesicular stomatitis virus (VSV)-OVA or wild-type (wt)VSV) were injected i.v. 1 day after cell transfer. Agonistic anti-CD40 Ab (100 μg) (FGK45) was given i.p. the day before and the day of cell transfer (22). Whole cholera toxin (CT; 10 μg) (Fluka, Switzerland) was administered orally starting the day before cell transfer and continuing daily for a total of five feeds. Control 232 mice received either rat IgG (Jackson Immunoresearch Laboratories, West Grove, PA) or oral PBS as respective controls. Intraepithelial lymphocytes (IEL) of the small intestine were isolated as previously described (23). Single cell suspensions of lymphoid organs were made using a cell strainer. 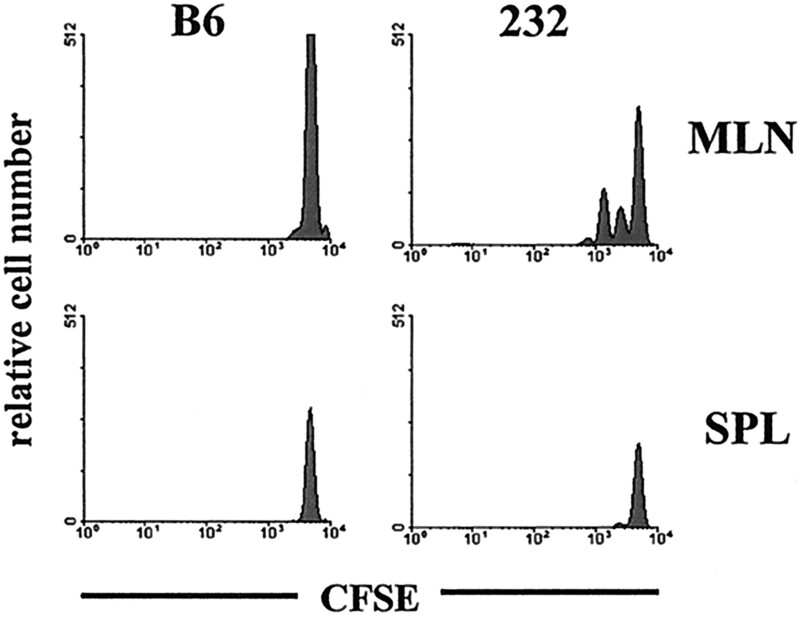 Ab specific for the following molecules, coupled to indicated fluorochromes were used for analysis: CD45.1-PE or Cy5, CD8α-FITC, PE, PerCP, or APC, and CD44-PE. Lymphocytes were analyzed by flow cytometry using a FACSCalibur (BD Biosciences, San Jose, CA). For histological analysis, small intestinal tissue was isolated and fixed in 10% formalin, paraffin embedded, sectioned, and stained with H&E. IEL were isolated and cultured for 5 h with 1 μg/ml GolgiPlug (BD PharMingen, San Diego, CA), with or without 1 μg/ml SIINFEKL peptide. After culture, cells were stained for surface molecules, fixed, and permeabilized to detect cytokines, according to manufacturer’s directions (BD PharMingen). Ab used were: anti-IFN-γ-FITC, anti-TNF-α-PE, and anti-IL-2-PE, along with fluorochrome-conjugated, isotype-matched Ig as controls (BD PharMingen). We have established a transgenic system in which small intestinal enterocytes exclusively produce a nonsecreted, cytosolic form of OVA, referred to as line 232 (17). Our previous results indicate that adoptive transfer of OVA-specific OT-I TCR transgenic CD8 T cells to 232 mice results in preferential expansion of OT-I cells in MLN and Peyer’s patches (PP) with subsequent migration to the intestinal epithelium (17). However, the site of initial T cell activation was not precisely determined. Thus, CFSE-labeled OT-I cells were transferred to 232 or B6 mice and lymphocytes from MLN, PP, and spleen were analyzed 36 h later. OT-I cells did not divide in B6 mice. In contrast, a portion of the OT-I cells in the MLN, but not the spleen, of 232 mice, had divided (Fig. 1⇓). Similar results were obtained from analysis of PP (data not shown). These results indicated that OVA produced by the intestinal epithelium was cross-presented by APC in the PP and MLN. The mechanism of presentation presumably entailed acquisition of Ag by APC, possibly through uptake of Ag-bearing epithelial cells, or absorption of protein from sloughed epithelial cells (24). In this system, large numbers of transferred OT-I cells accumulate in the intestinal epithelium, due to initial antigenic encounter and proliferation in LN, with subsequent migration to the mucosa. Importantly, no tissue damage occurs despite the presence of OT-I cells adjacent to Ag-bearing epithelial cells. Thus, this is a tolerogenic response to self-Ag and, according to current literature, tolerogenic APC would be responsible for such presentation (13). Results from earlier studies imply that if CD8 T cells enter an Ag-bearing organ, autoimmune disease will occur, but this is not necessarily true with the intestine (16, 20). Enterocyte-produced Ag is cross-presented in the MLN. OT-I/Rag−/− cells were labeled with CFSE and injected into either B6 or 232 animals. MLN and spleen (SPL) were harvested 36 h after transfer and lymphocytes were analyzed by flow cytometry. Histograms show CFSE fluorescence of gated donor OT-I cells. Our previous results showed that infection with a virus encoding OVA along with OT-I transfer resulted in intestinal disease, which was fatal and characterized by specific destruction of enterocytes (17). However, in this and most other models, Ag was provided by the infectious agent. Therefore, we wished to determine whether other inflammatory agents, in the presence of only endogenous, tolerogenic, cross-presented Ag could induce disease. Naive OT-I/Rag-deficient cells were transferred to 232 animals, as well as to nontransgenic B6 mice, and inflammation was induced by infection with VSV-OVA or wtVSV, or treatment with CT or an agonist anti-CD40 mAb. It should be noted that wtVSV, CT, or anti-CD40 were incapable of activating OT-I cells transferred to nontransgenic B6 mice (data not shown). 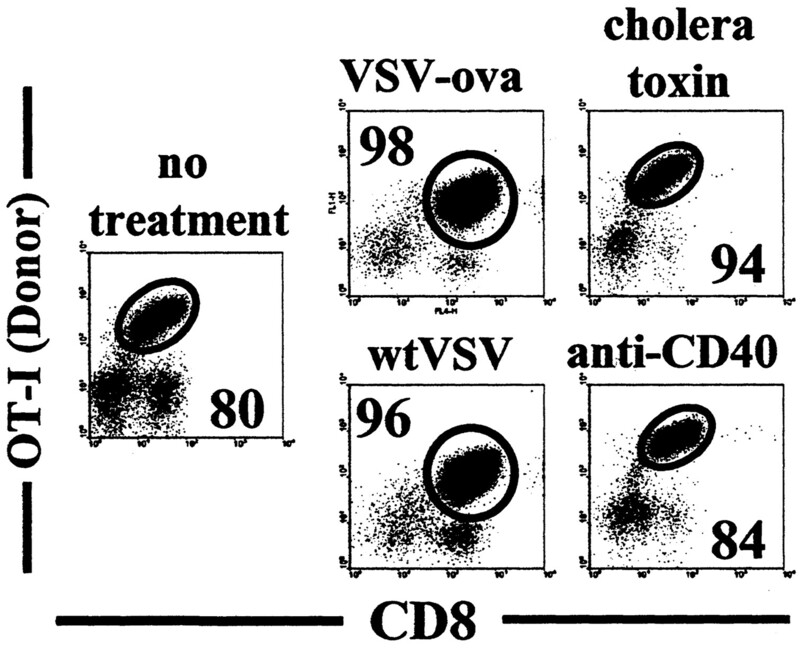 Infection with wtVSV, as with VSV-OVA, resulted in the induction of fatal intestinal disease (Table I⇓). The kinetics of disease progression were the same in the two groups (data not shown). These results indicated that this infection per se was sufficient to drive autoimmunity, but was dependent on the presence of transgenic self-protein. Because VSV is a lytic virus and the infection was likely systemic, we wanted to determine whether localized inflammation would alter the response. Therefore, control B6 or 232 mice received OT-I/Rag−/− cells and were fed CT. Only ∼40% of the 232 mice survived this treatment, as compared with 100% of B6 mice (Table I⇓). Because both VSV and CT could potentially cause epithelial damage, possibly resulting in additional Ag release, we wished to show that the effects were at the level of the cross-presenting APC. Thus, we injected 232 or B6 mice with an agonistic anti-CD40 mAb to mimic the effects of inflammation on APC. This treatment resulted in fatal disease in ∼60% of 232 mice, whereas all B6 animals survived. These experiments provided compelling evidence that a tolerogenic response to cross-presented Ag could be reprogrammed to an autoaggressive response by modifying the environment in which CD8 T cell priming occurred. Therefore, the inflammation needed to drive tissue-damaging responses could be physically disassociated from the Ag itself. However, combined detection of Ag and inflammation was sufficient to drive Ag-specific autoimmunity. The fact that inflammatory mediators from either viruses or bacteria can suffice in this regard, with no dependence on tissue damage, showed the potential of various types of infections to produce an environment where autoimmunity can be primed. To determine whether the treatments resulted in similar OT-I cell activation and expansion, IEL were analyzed for the presence of OT-I cells. Five days after transfer with no treatment, OT-I cells made up ∼80% of IEL (Fig. 2⇓). However, infection with VSV-OVA, wtVSV, treatment with CT or anti-CD40 resulted in a slightly greater expansion of OT-I cells. OT-I cells could not be detected in IEL of B6 mice, in agreement with previous data showing a need for activation to induce migration (25). In absolute numbers, at day 5 after cell transfer, 232 mice receiving just OT-I cells had an average of 4.4 × 106 total IEL, whereas concomitant treatment with CT increased cell numbers to 17.5 × 106. The inclusion of anti-CD40 mAb only marginally increased IEL numbers from 3.0 × 106 cells in control mice to 4.6 × 106 IEL in treated mice, 6 days after transfer. These results indicated that although inflammation could potentiate cell numbers, this effect was not required for disease induction. OT-I cell expansion in the intestinal epithelium is enhanced by inflammation. OT-I cells were transferred to 232 mice treated with the indicated agents and 5 (VSV, CT, no treatment) or 6 (anti-CD40) days later, IEL were analyzed for the presence of OT-I cells. Numbers indicate the percent of OT-I cells within the total lymphocyte population. The level of tissue damage in each case was examined by histological analysis. In Fig. 3⇓, H&E-stained jejunal tissue is shown. When OT-I cells were transferred alone, no intestinal damage was seen. Similarly, B6 mice receiving OT-I cells and anti-CD40 mAb or CT did not incur any intestinal damage (Fig. 3⇓ and data not shown). In contrast, OT-I transfer and treatment with VSV-OVA, wtVSV, CT, or anti-CD40 resulted in crypt hyperplasia and villus thickening and blunting. Overall, the tissue damage was more extensive in VSV-infected mice, in agreement with the decreased survival in these groups, compared with the CT or anti-CD40 mAb-treated groups. Nonetheless, the latter two adjuvants induced substantial pathology. Intestinal pathology is driven by inflammation. Sections of the jejunum were isolated from mice treated with the indicated agents at 5 (VSV, CT) or 6 (OT-I alone, anti-CD40) days after cell transfer. H&E-stained images are magnified ×100. The data presented thus far showed that the response to endogenous, tolerogenic self-Ag can be shifted to one resulting in a specific autoimmune process, by inclusion of byproducts of an infection, irrespective of tissue-damaging properties of pathogens. This, however, does not account for the impact of bystander inflammation on Ag-specific T cells. Therefore, we examined the effector function of OT-I IEL. Fig. 4⇓ depicts the cytokine secretion patterns of OT-I cells isolated from IEL of 232 mice. IEL from B6 animals are not shown due to the lack of OT-I cells, as mentioned above. Only a small percentage of OT-I cells in animals with no treatment produced low levels of IFN-γ, TNF-α, or IL-2 (Fig. 4⇓). However, treatment with CT or anti-CD40 mAb resulted in large increases in the number of cytokine-producing cells. 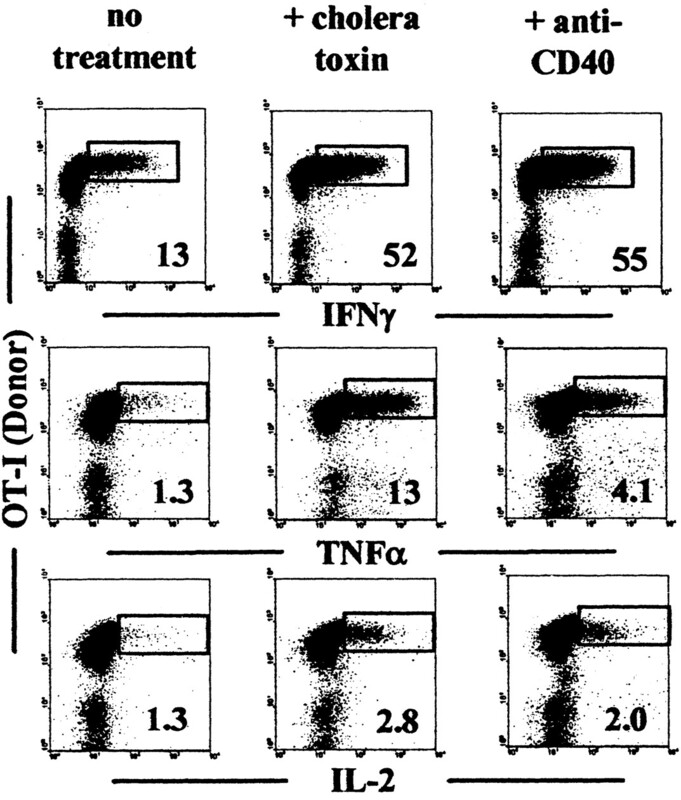 Notably, the number of cells producing IFN-γ and TNF-α increased 4-fold and 10-fold in CT-treated mice and 4-fold and 3-fold in mice receiving anti-CD40 mAb. The number of cells producing IL-2 also increased ∼2-fold. Thus, these findings indicated that inflammatory mediators potentiated the priming response to self-Ag, resulting in augmentation of effector function. Potentiation of effector functions of OT-I IEL with addition of inflammatory agents. Lymphocytes were isolated from the small intestinal epithelium of 232 mice treated with the indicated agents at 5 (CT) or 6 (no treatment, anti-CD40) days after cell transfer. Intracellular cytokine staining was performed after a 5-h culture. Numbers reflect the percent of OT-I cells producing a cytokine. The results presented in this study provide a basis for autoimmunity induction by infection or inflammation. Because our results are completely dependent on the presence of cross-presented self-Ag, this cannot be termed T cell bystander activation. In light of these observations, some bystander autoimmunity may be explained by the as yet molecularly undetermined presence of self-Ag where T cell priming occurred. Because the prevalence of autoimmune diseases indicates that negative selection is not fully effective, it is possible to envision a situation in which T cell responses could occur to cross-presented tissue-specific Ag, and, if inflammatory mediators are present by virtue of a concomitant infection, autoimmunity is initiated. These results are in agreement with the general concept of danger, notably that there is no discrimination of self in the periphery, only the ability to recognize self within the environment (26). In a quiescent state, most proteins are regarded as inert. However, when agents are noted as being harmful, inflammation ensues. Molecularly, potential harm can be assessed through Toll receptors, which detect microbial products (27). Other pathways must also play a role, although all such mechanisms are not clear. We do not expect that all pathogens would have the properties necessary to induce signals needed for optimal effector cell priming as seen in this study. For example, in a mouse model of diabetes, where a lymphocytic choriomeningitis virus (LCMV) epitope is expressed on islets, infection with LCMV drives disease. However, infection with vaccinia virus encoding the correct LCMV epitope does not induce diabetes (28). This is in agreement with the observation that vaccinia virus does not cause dendritic cell maturation (29). The precise mechanisms by which infections or adjuvants impact cross-priming events are unknown but are likely to be directed at the APC. APC themselves may be targets of infection, thereby modifying cytokine production and costimulatory molecule up-regulation. Adjuvants, such as CT, may induce cytokine secretion by intestinal epithelial cells, which may have downstream effects on other cells. The anti-CD40 mAb treatment could activate cross-priming APC and result in enhancement of the CD8 response. However, regardless of the mechanism, the end result here was the same: increased CD8 effector function followed by intestinal disease. Our results demonstrated that a cross-priming event, which normally leads to tolerance, can be redirected to a productive, and subsequently destructive, response. Naive T cell priming to self-proteins, which are by default presented on MHC molecules on APC, can progress to autoimmunity within the right context, when byproducts of pathogens combine with cross-presented Ags. Thus, deleterious reactivity to self-Ags may be contingent on the environmental cues delivered to the T cell during the priming phase. This indicates that cross-tolerizing APC can become immunogenic and explains how a wide variety of pathogens, which have no apparent homologies to each other or to self-proteins, can be associated with the initiation of specific autoimmunity. ↵1 This work was supported by U.S. Public Health Services Grants DK57932 and T32-AI07080 (to V.V.). ↵3 Abbreviations used in this paper: MLN, mesenteric lymph node; VSV, vesicular stomatitis virus; wt, wild type; CT, cholera toxin; IEL, intraepithelial lymphocyte; PP, Peyer’s patch; LCMV, lymphocytic choriomeningitis virus.